The ruling Christian Democrats (CDU) and their sister party, the Christian Social Union (CSU) have agreed to put a limit on the number of refugees Germany would accept on humanitarian grounds each year. They also laid out further steps to regulate migration in a regulatory framework. What are the key points of the plan? The new plan on migration was agreed upon by CDU and CSU on Sunday night and will be a key discussion point in the upcoming coalition talks with the Greens and the Free Democrats. 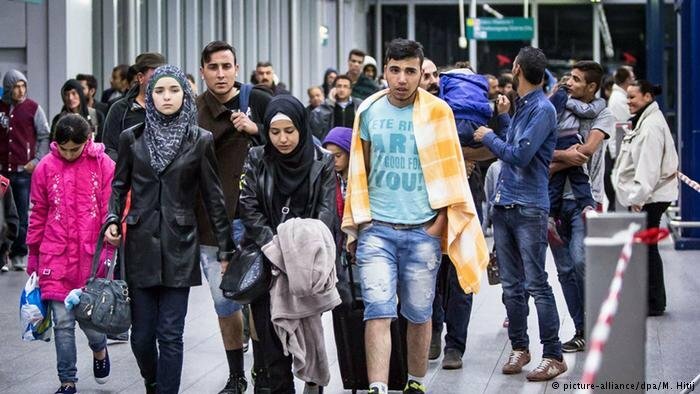 Limit of 200,000: Germany will be ready to accept 200,000 people each year on humanitarian grounds. This number includes refugees, asylum seekers, people with subsidiary protection, family members within family reunification processes, persons in relocation and resettlement programmes minus persons who are deported or returned voluntarily. Even though this limit is not referred to as a "refugee cap" ("Obergrenze für Flüchtlinge"), in essence it amounts to exactly this. It puts an upper limit on the number of migrants allowed. The Christian Social Union had long demanded a cap, with its chief Horst Seehofer saying, "an upper limit on immigration is the prerequisite for integration and security." Angela Merkel’s ruling party, on the other hand, had opposed the cap. Exceptions in times of crises: The limit of 200,000 will be flexible. CSU politician Thomas Kreuzer explained with an example in a radio interview with public broadcaster Deutschlandfunk on Monday: "If war breaks out in a country close to us - like it happened in the former Yugoslavia - this would be a situation where neighboring countries would have to help until the war was over. The limit that we have decided on now would not hold." In the "normal case," however, "the 200,000 are not to be exceeded." Right to asylum stays unchanged: There will be no compromise on the right to asylum. The right to political asylum is enshrined in Article 16 of the German Constitution (the "Grundgesetz") and Chancellor Merkel has said that this fundamental right will remain unquestioned, that is, those who are fleeing political persecution in their home countries will have a right to seek asylum in Germany. Many critics and rights groups had feared that a new strategy on migration would entail an infringement on the rights of asylum seekers. Furthermore, the plan states allegiance to the Geneva Convention and to the EU's obligations concerning asylum regulations. Centers for waiting and returning migrants: New centers will be set up from where migrants will be able to file their application for asylum and wait for a decision. If they are accepted, they will be free to move in the country. If the application is rejected, the migrants will be confined in the center and will have to return to their home countries either voluntarily or by way of deportation. The system of "decision and repatriation centers" to group migrants together is based on the Swiss model. Family reunification moratorium extended: the pause on family reunification for people with subsidiary protection, initially set to expire in March 2018, will continue. Fighting root causes of migration: This point is not yet defined in detail. The plan states joint efforts to fight smuggling, securement of EU borders, cooperation with the UN's refugee agency UNHCR and the International Organization for Migration (IOM) to implement legal reception measures. Cooperation with countries of origin: Cooperation is to be intensified with countries of transit and origin. Partnerships with countries in the Mediterranean region will organize the return of migrants from the Mediterranean to their home countries. The EU-Turkey deal is mentioned as a model. "This all will have an effect and we will reach a sustainable reduction in numbers," CSU’s Thomas Kreuzer said. Expanding the list of 'safe countries of origin': The list of countries defined as "safe countries of origin" by the German government shall be expanded. The plan names Morocco, Tunisia and Algeria as examples. Citizens of countries on the list have lesser chances of being granted asylum. EU measures: The plan calls for EU-wide asylum screenings before migrants enter EU territory. Furthermore, the Dublin Regulation as well as the Common European Asylum System (CEAS) are to be reformed. Priority to skilled migrants: Migrants will have better chances to be granted asylum if they have skills to join the German labor market. There are no details yet as to how and at what point during the asylum process skills shall be assessed. Experts are seeing this part of the migration plan as the start of a migration law in Germany - one that prioritizes migrants according to qualification, knowledge of the German language or other criteria. Are family reunifications biased against women?